The Lazy Teacher's Guide To TEFL is a very simple instructional guide book for those who are lazy, new to TEFL, want to save time or are looking for an easy way to teach English abroad. It is a quick start guide to teaching English as a second or foreign language. It takes a less is more approach to TEFL. This focuses more on teaching English to children aged from about 5-13 (beginners & intermediates) than it does adults. Teaching children is also a large part of the job market in Asia. 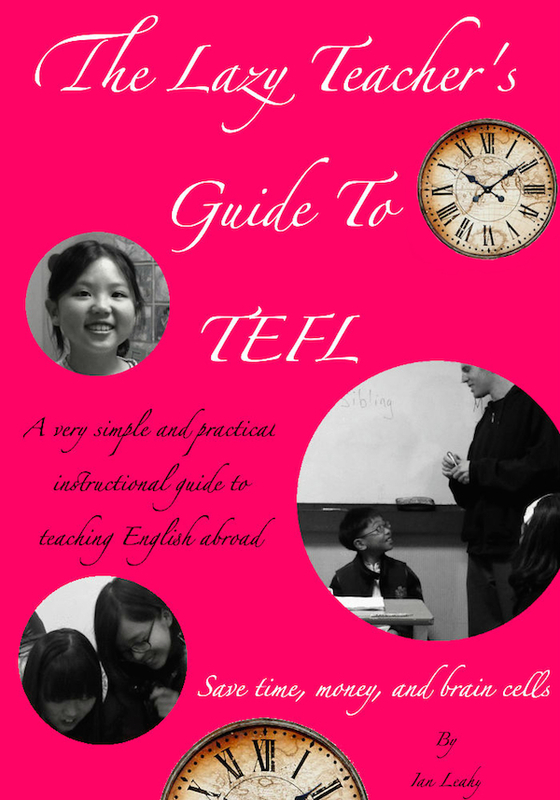 It's not a comprehensive guide on teaching abroad nor is it a TEFL course guide. Again it's a simple instructional guide to teaching ESL. It's not going to help you find a job or a girlfriend. But it's going to help you do your job and it's one of the best books you can get for teaching English to children especially if you are a beginner teacher. Your other options for training are to take a TEFL course or to teach yourself. If you take a course chances are you will not remember all of what you learned. You can be overwhelmed with information. With The Lazy Teacher's Guide To TEFL you'll learn less than you would in a course, but you'll remember more. It's going to save you money, lot's of time, energy and brain cells. If you take a TEFL course they will teach you that, but what they won't teach you is how to do it efficiently. You could spend an hour planning for a 1 hour class and if you teach as many as 6 one hour classes a day (common in hagwons in Korea) then that's another 6 hours for a total of 12 hours a day of teaching related work. This ESL teaching guide will show you how to outline a lesson and write it quickly. Another way this guide is going to save you time is by showing you games and activities that can be inserted into your lesson that require little to no preparation. Some games and classroom activities take time to prepare and some are little more than a distraction and are hardly effective as educational tools. But this guide is going to show you some that are both time savers and effective tools. is going to go in one ear and out the other. is just not practical or useful. This guide is not comprehensive. It does not cover all aspects of teaching such as teaching business English, lecturing, telephone teaching, English for special purposes, etc. It will not overwhelm you, but it will get you started off on the right foot with the essentials. If you don't take a course - you often don't have to, then you are just going to have to figure that on your own. So it's possible, but it's going to take time to find the right info that works. I have a confession and it's that I am lazy. And if you are reading this then well chances are you are too. At least in something you are. And if for some reason you still don't consider yourself lazy, well then wouldn't you like to save time? I have to admit that most of my work on ESLinsider.com was developed with the lazy teacher in mind. All of those how-to videos were inspired from years of wasted time spent looking at boring disorganized instructions for how to do such and such an activity in the classroom. When I first started teaching English in Taiwan I would spend a lot of time preparing lessons. My boss made me come to work early like an hour and a half or so to prepare for like 3 hours of teaching. That was unpaid too as I was only getting paid by the teaching hour. It was stressful in the beginning. I spent a lot of time writing plans that weren't very good and that I couldn't even follow well myself. I somehow managed to survive that first year and then relocated to the southwest of Taiwan and found a job in a better buxiban. The owner cared more about education and gave me some additional training. I got a few more hours teaching at her school, but she still expected me to show up early and prepare. I had a friend teaching in Koahsiung who had been teaching for years. I asked him how much time that he spends preparing for class, he was like, "I don't know, it depends maybe a couple of minutes." A couple of minutes?! Wow, I was envious and in a state of awe. At that time I was spending like 1.5 hours preparing for 3 hours or so of teaching. He was like, "You know it's just a matter of time until you figure it out". So that became my goal. After 2 years in Taiwan I moved to Korea and started teaching there in a hagwon. I had more classes and less time - unless I wanted to come in early to prepare. But by then I had accumulated some knowledge, techniques and activities to make my classes more interesting. Anyways I was getting lazy then and even one manager there complained that I came in too late. But I was content with the fact that most of my students liked me and enjoyed classes, so I didn't sweat it. The whole point of this guide is for you to save time. Whether you want to go to the beach, go for a hike, or hang out online chances are you would like to save time. If you are lazy like me then this guide is going to start off simple and when you learn those simple things then there will be links where you can go for more info, but only if you want or have the time. Taking a course is a good idea. But sometimes you can get overwhelmed with all the information. If you are constantly getting new information thrown at you without practicing any of it then you are going to forget it. "If I knew everything in this guide before I started teaching abroad my first 1-2 years would have been way easier. - Ian Leahy"
That's why it's better to start off slowly and take in only as much as you can retain. So since you're probably lazy just like me, let's get started.